All Dip N Dunk Lacrosse counselors are current high school coaches or former/current college lacrosse players. In addition, almost all the coaches have played and excelled at the division 1 level and many have coached at the Division 1 level. Each counselor in the Dip N Dunk Lacrosse Staff helps develop the campers in their expertise. Dip N Dunk Staff members have accolades as high School coaches, face off specialists, goalies, offensive coordinators, attack and midfielders. The Dip N Dunk Lacrosse Staff believes in positive coaching and life long learning. Our staff attends the US National Lacrosse Conventions and the IMLCA College Coaches Lacrosse Convention. James Ardizone- Current defensive coordinator for North Rockland and former Byram Hills and Tappan Zee Head Lacrosse Coach. Coach Ardizone is also a co-founder of Tappan Zee Youth Lacrosse. 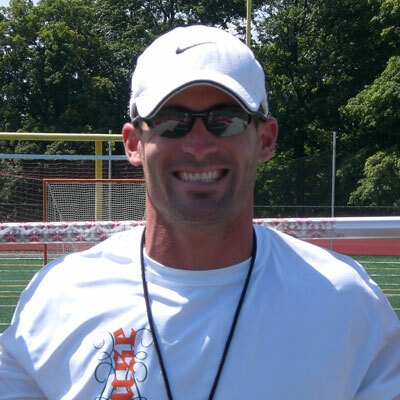 Coach "Ardi" was recognized as the 2014 Class B coach of the year, 2011 Class B Coach of the year, and the 2006 Rockland County and USILA Division B Coach Of The Year. Coach Ardi was a Defensive Coordinator for the Hudson Valley Empire Team. In his four years as Defensive Coordinator and assistant coach Hudson Valley received two Bronze Medals (1st medal in 6 years) and a win over Long Island (1st win in 15 years). Prior to Tappan Zee, he was a 1st Assistant for the Manhattan College Men's Lacrosse Team for 4 years. Highlighted by an undefeated MAAC season and MAAC Championship. Manhattan was one of only 12 teams in the NCAA National Championship. The Jaspers fell to Georgetown in a respectable 12-7 loss. Currently a physical education teacher with a masters in special education at Byram Hills High School. Outside of the Empire State Games, Coach Ardizone has coached at Primetime Lacrosse, Dip N Dunk Lacrosse, Connecticut Chargers, Matrix lacrosse and is currently coaching NJ Riot Lacrosse teams this summer. Coach Ardi was also ranked nationally in most Face-Off statistics in college. Coach Ardizone currently faces off for Dip lax in the soundshore division and TROG in the Lake Placid Lacrosse Summit. All staff are current teachers or collegiate players. Lady Lightning Staff Coming Shortly!!! We are proud to say that many of our staff has come through our camp system. Don Femminella - Currently a Head Coach at Red Bank Catholic HS in NJ. Don was a two sport All-Conference standout at Massapequa High School in football and lacrosse. After high school he went on to play at division 1 Manhattan College, where he was a four year starter, 2-time captain and ALL-MAAC Midfielder from 2002-2003. During his 2002 season at Manhattan, he lead his team to a undefeated season in conference, only to fall to Georgetown in the NCAA tournament, losing 12-7. After graduation he served as assistant coach for 3 years at Manhattan. Currently he works as a District Manager for Lacrosse Unlimited in the New Jersey area. He still actively plays in many summer tournaments and leagues such as War at the Shore, Vail and Lake Placid. James Amandola- Current Assistant Coach and HOF member for Division 1 Manhattan College. Former Varsity Coach at Tappan Zee and former Director/founder of Tappan Zee Youth Lacrosse. While at Tappan Zee Coach Amandola was a two time Rockland County Coach of the Year and Section I Class B Coach of the Year. James Amandola is also a former assistant varsity coach at Sewanhaka high School (Floral Park, NY). Coach Amandola received numerous awards while a Jasper at Manhattan College. He was the MAAC conference defensive player of the year, two time all-MAAC tournament team, MVP of the MAAC championship. Coach Amandola was also selected to the North/South Game and ranks all time in most NCAA goalie statistics. In 2002, Coach Amandola received "The Wall" award for best goalie performance in a season (24 saves vs Georgetown NCAA tournament) and had the best save percentage in the nation (67%). Coach Amandola is a social studies teacher in South Orangetown Middle School. Will Ramos- A former Dip n Dunk Camper and Current Matrix Club Coach, Will was Named the #96 recruit in the Class of 2017 by Inside Lacrosse, the 10th ranked goalkeeper in that class... Played lacrosse at Nyack High, leading the team to the Section 1 tournament in 2017... Had a 71% save rate as a senior to take Nyack to 11 victories, including 279 saves, 11 goals and six assists. All time Section 1 saves leader. Tyler Senatore- Tyler is a 3 time All Section, 3 X All- County player, and currently a top offensive player on St Thomas Aquinas Men's Lacrosse Team. Tyler was second on his college team in scoring last year as a freshman. Mark Paul- Mark was an all county selection that played Division 1 lacrosse at Sacred Heart and finished his last year as a Starter for St Thomas Aquinas. A former assistant Coach of the Tappan Zee Boy's Lacrosse Team, Mark is currently a Junior Varsity Lacrosse Coach for Suffern High School. More information on camp staff coming soon!! !